Seven defendants in Kemerovo mall fire case go on trial | Russian Legal Information Agency (RAPSI). 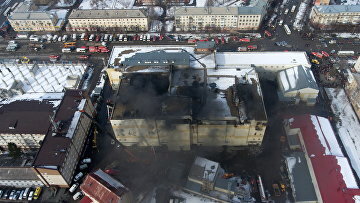 MOSCOW, April 12 (RAPSI) – A criminal case over the over tragic fire in Zimnyaya Vishnya (Winter Cherry) mall in Russia’s city of Kemerovo that left 60 people dead has been forwarded to court for hearing, RAPSI has learnt in the press service of the Prosecutor General’s Office. Seven defendants including Yulia Bogdanova, CEO of the Kemerovsky Confectionary Combine, a company owning the mall, technical director of the mall’s owner company Georgy Sobolev, the mall’s manager Nadezhda Suddenok, a guard who allegedly turned off the emergency notification system when he received a fire signal Sergey Antyushin, CEO of the company System Integrator that developed the fire safety system Igor Polozinenko; an employee of the company, who personally installed the fire alarm Alexander Nikitin and fire team commander Sergey Genin, will stand trial. The fire occurred in the mall on March 25. According to investigators, 60 people including dozens of children were killed by fire. Initially it was reported that 64 people died. Nearly 150 people were hurt. The blaze destructed property of 140 individuals and 100 companies totaling 293 million rubles (over $4.5 million). A criminal case has been launched over involuntary manslaughter, violation of fire safety regulations that left more than two persons dead and provisions of services that don’t meet safety requirements.